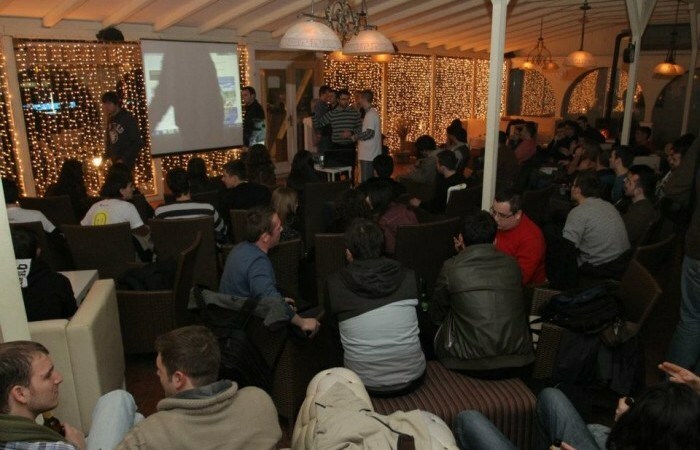 The number of the people interested to participate in this innovative event increased significantly in the BarCamp Prishtina #3 held at Hecienda bar. This time the number of the people in the audience increased to approximately 120. Shpend Sadiku, Betim Drenica and Arianit Dobroshi were the guest speakers and all of them developed an interesting debate with audience. Shpend shared the history of Telegrafi.com, the reasons behind its creation, modes of operation and new projects in the works. During his speech he discussed with the audience the current system for online payments and marketing in Kosovo. Drenica, during his speech, presented about mobile application development in Windows Phone 7 platform. He spoke about his experience working with the Microsoft platform and his work with Microsoft products. He presented one application which he developed for Windows Phone and then opened a discussion with audience about the variety of platforms they can use to develop applications. The discussion was very lively. People asked about how he is planning to monetize the application and how to transfer the earned money to Kosovo bank accounts (that seems to be one of the greatest problems developers face in Kosovo). Then there were some more general discussions about what the rational is behind developing for a small platform such as Windows mobile instead of iOS or Android. Building on the discussion begun at Bar Camp #2 on intellectual property, Dobroshi explained the basic concepts about intellectual property and copyright, the potential for the modernization of laws in world and in Kosova. He had an open debate with audience about problems on legislative process and law enforcement in Kosova. Most of the discussion was centered on how poor people in Kosovo can afford copyrighted material in a legal way. Some people argued that copyright infringement helps Kosovo while some other responded that there are alternatives. Arianit pointed out that copyright should not be as restrictive as to infringe on people’s liberties.